Renta! is The Official Romance-manga Site. We provide a ton of exclusive Manga which are perfect for those of you who are in love, dream of romance or simply love reading passionate stories. You can enjoy an abundance of officially-translated romance manga. And you can read all sorts of love stories that will stimulate your senses and suit your tastes. Renta! is a digital-manga streaming store. Why is streaming good? -Because you can read manga anywhere, anytime, on any device. There are two ways to buy manga on Renta!. The first is to use the "USE CASH" button to pay for your rentals on the spot. Just click on the button, which you can find on the product page for all our manga, input/confirm your payment details, and read your chosen manga. The second way is to use our point system. You can buy points, which are then added to your account. They can be bought in sets of 1000, 3000, 5000 and 10000. If you choose to buy a large number of points, you will get some free. With 3000 you get 200 extra, with 5000 you get 400 extra, and with 10000 you get 900 extra. You can choose between 48-hour or unlimited rental. You can also initially choose to rent for 48 hours, then upgrade to unlimited afterwards. We update our site every Tuesday and Friday with a whole variety of content. So you can enjoy reading new manga every week!! 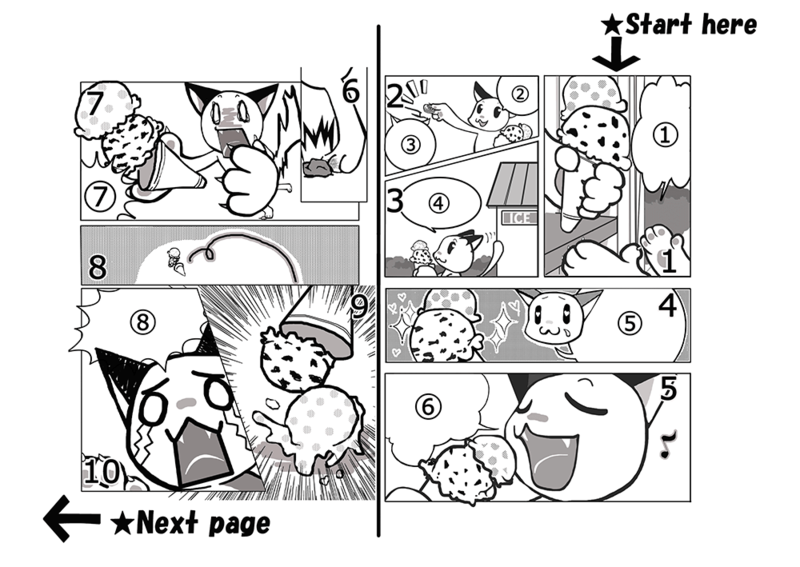 Manga is read from the top right-hand panel to the left, and then downwards, continuing from the right to the left. Please follow the order like in the example picture below.